What is a Retro Reflective Sign? As a premier traffic control service, Roadway Construction Service (RCS) is on a constant mission to increase traffic safety through its temporary traffic control services, permitting and planning. From carefully-trained Flagging crews to top-flight equipment, our depth of traffic management experience resources ensures that we consistently meet this goal. But protecting roadways doesn’t always come down to the big solutions. Sometimes subtler means can play a huge role in a general safety strategy. Case in point is the Retro Reflective Sign. As with all other roadway signage, a Retro Reflective Sign communicates information or warnings to motorists. What distinguishes this type from all others is its remarkable visibility. Designed to gather and reflect illumination from vehicle headlights, these signs deliver messaging with extraordinary vividness – bright, crisp, and visible from longer distances. 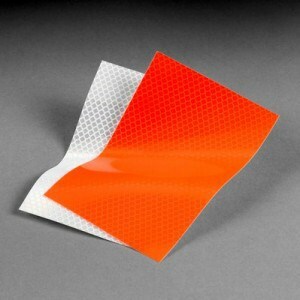 Their uncommon brightness is the result of special reflective sign sheeting. Being easy-to-see, even on dark roads, a Retro Reflective Sign clearly are doing a great deal to increase traffic safety and pedestrian safety in highway construction work zones. Increasing traffic safety is not the only advantage offered by a Retro Reflective Sign. Using existing headlight illumination exclusively, these signs have no need of electrical power. Their electrical supply is free of charge (courtesy of passing motorists), self-contained, and self-generating. Which means lower municipal power bills, money in the pockets of taxpayers, and a helping hand for the environment. The advantages of retro-reflectivity easily extend to other types of traffic safety measures, including temporary pavement marking in work zones. For instance, special reflective paint currently is being utilized for wet-weather visibility and wet-weather recovery pavement marking. By improving the visibility of these markings, retro-reflectivity is providing a high level of safety to motorists, even in inclement weather. Realizing the clear-cut advantages of retro-reflective signs, Caltrans has started using them to increase traffic safety, as well as save money and energy for Californians. The organization’s initial involvement with the signage came about in 2015, when it began installing new overhead retro-reflective signs on Interstate 80 in Sacramento.